Reminds me of an incident which was reported to me when a Muslim guy and another passenger were sitting next to each other on a UL flight.The other seeing free alcohol being served on the flight was having one too many much to the annoyance of the Flight Steward and he asked the Muslim passenger by his side why he doesnt take advantage of the free alcohol being served on the flight.The Muslim replied “My religion doesnt permit the intake of alcohol”The passenger told him how stupid he was for refusing free liquor and was continiously having a dig at the Muslim for refusing the free offer.. The Muslim guy by way of retort told the co-passenger “Ok if you can make the Captain of this flight take a few drams of Arrack while at the controls I too will participate in a drink with you”. The passenger replied “No way if he gets drunk he will bring the whole damn plane down with its 290 passeners”. The Muslim then told him that is why he avoids intake of alcohol not only for religious reasons but also because one man drinking (like the pilot now in question) could jeopardise the lives of hundreds of innocents. I think all airlines should make it a taboo to serve liquor on board(as at times we witness passenger brawls under the influence of booze)as much as they have done with smoking. Colin I full agree with you. Ban alcohol, and while at it charge an excess charge for those whose body mass ratio exceeds an agreed limit (whatever the healthy standard) and those with their bodies spills over to the adjacent passengers seat space. I hate flying for these two reasons, and hope that the airlines will clean up their act. 1. Every extra unit mass of flesh and fat requires 4 times the fuel mass to transport it by air. So there will be tremendous energy savings to be made if airlines are sharp and get busy. Also why should average-weighted passengers pay for the fuel surcharges of the bulky – given that fuel surcharges are evenly spread out to all passengers. Time to tell of the airlines. 2. Alcohol is combustible and if there were to be a cabin fire, it would increase the risk of fire spread rapidly. So all those insisting on alcohol to douse themselves or carrying them to their destination are contributing to the risk of fire and negative outcome. 3. Why don’t the airlines do something about it? First it is the turf war between airlines trying to maximize their profit …. the baskets! Nobody wants to be unpopular with the public, or certainly want to be seen as the first. If a world authority or national authority imposes such regulation airlines might accept it and implement. But then even the governments are involved in this business conspiracy. They want to strip the citizen the last penny that they could get hold of as taxes. More money changing hands, greater the tax they could trawl in; never mind the safety, passengers budgets and discomfort to victimized air travelers. Well done Captain. You are no son of Sri Lanka, you are an embrassment to the aviation community of our nation. 15 hours grounded,that was the heading, I don’t want to imagine the amount of lost revenue. Why do we employ these clowns ? Pull your socks up Sri Lankan airlines, stop becoming the biggest aviation joke. Thousands of our children aspire to enter aviation,is this the example we are setting for them. Delinquency is a disease. Seriously are we better off not having an airline, as to paying millions of tax payer hard-earned money to pay ridicules penalties. God help our degenerates and save our children. We have already ruined their future. Whose picture have you used ? I hope that guy sues the pants off you ! By the way who the F**ks are going to bare the compensation???? Tax payers . Not the stupid pilot and his kith and kin.He should be jailed. This is a fix by ……? Why was Capt not allowed to talk to media? What is there to hide? Why was there no spare crew ? Was he not over worked ! and refused fly due to ill , health?, overworked yes ! Does the Air line have no alternatives to act ?than grounding a plane due one captain. He is among very few pilots who announced in Sinhala during flights so enemies in today’s sri lanka ? 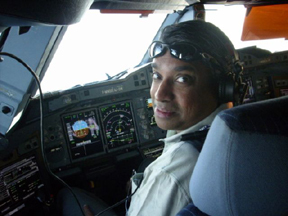 In Sri Lankan airline he was a leader among pilots was Secretary of Pilots association. Captain Upendra was AFS Scholar, a brilliant Student at Trinity, gave-up of education after all 9 –A distinctions- grade in O-levels due to financial strains. Today he is caring for the family and the ailing mother .A fine son, father.He was great Kandyan dancer too a versatile character who made enemies due being straight. This is the story of the first airline pilot ever arrested and sent to prison for flying … his way to the pinnacle of commercial aviation, airline captain. this is The cash-strapped airline is due to stop its flights to Frankfurt from October as it slashes routes to European destinations. It is also planning to lease out some of its A330 planes to other airlines in an attempt to raise cash. Suffering from an accumulated $1-billion loss, it is seeking a foreign partner to take over its management. b)Drunken pilot are common so is drinking in cockpit. google see the hundreds of cases of drunken pilots. The above reasons is what you subscribe in defence of Capt.Upendra. But I think its your nationalist fervour of he giving announcements in Sinhala that has prompted your plea for him completely overlooking the fact that hundreds of lives were at stake. what kind of a moron are you how is it relevant that he announces in sinhala and him being charged for being drunk? about the captions condition that he is not fit to fly. For sure he should be grounded – also should consider his situation sympathetically and not treat him as a criminal. I think as the punishment the Government should appoint him as a CTB Driver and after sometime promote him as the Railway Engine Driver! Last visit paid to lanka was few weeks ago. CTB bus or private bus drivers are careless by their nature. I thought these men would have learnt it as of now. Decades passed, nothing like in that line is achieved. Disipline and the respectful behavours accompanies ones life from the kindergarten on. Not only parents, but also schools must make every effort in contributing the building of fulfil citizens. In the past, Hamuduruwos did a key role in the building of the society. But to date, that has been changed a lot … I happened to see even Hamuduruwos were only busy iwth thier mobile smart phones rather than being SILWATH….. almost all values in such religious men have eroded to all deterioration levels. Sad but the truth. I thought Airlines have standard operational procedures which are to be strictly adhered . Please note that Captain Upendra who was also Manager for safety , should have been an example for others to follow. let’s treat this is as a very serious incident and show this as an example for the future pilots who want to drink and fly. Upendra was a model student at School.He is true patriot since he stayed with the national airline for 27 yrs.when others left to join foreign air lines,fearing Sri Lankan will colapse. He wouldn’t be in trouble if he did not testify in the Weliamuna commission and other acts against corruption…His code piilot(pilots guild member) “set him up” in Frankfurt…TRUTH WILL PREVAIL at the correct moment. Clipper Victor!